CHONGQING, China — Anyone who has stood on the field while the United States’ national anthem plays knows that sometimes it can feel like an eternity. In the stands, you can simply enjoy the song and feel patriotic, but it’s never quite the same as when you’re about to compete. “The Star-Spangled Banner” takes on a new meaning, especially when you’re representing your country. My thoughts during the national anthem has changed over time. I used to focus on the game. That can make me nervous, though. Now I try to feel gratitude for the opportunity to do what I love, and to do it wearing my country’s national team crest. I think of all the girls who dream of being where I am, and all the times I cried and fought for this opportunity. 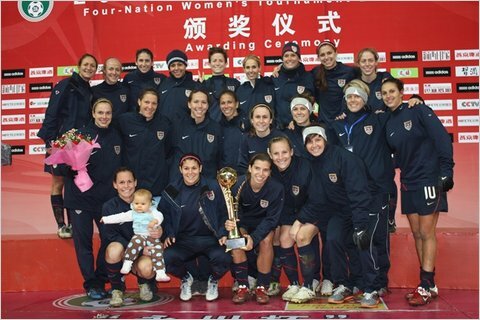 On Tuesday night in China we beat the hosts, 2-0, to win the Four Nations tournament. After the first three games of 2011, I would say the team consensus is that it was good to have pulled out the win, but we still have a lot of work to do to be where we want to be. I got my first cap at this tournament in 2007. Since that time, I’ve been in and out of camps, on and off rosters. I may not be the most experienced player for my age, or the most accomplished, but I am very proud of how much I’ve improved over the past four years. And I still feel that I can be so much better. I am O.K. being patient with myself and the process, and I take a lot of pride in constant improvement. My first goal in 2011 was to make the roster for this tournament. I try to go into tournaments with an open mind, obviously aiming to prove that I can contribute, but mostly just focused on soaking up as much information and experience as I can. At this point, I have to focus on what I can control — and that’s being ready for any chance that I get. It can be stressful being a sub. Often, I find it more mentally draining than starting. You have to be completely plugged in and ready at all times, never knowing when (or if) your moment will come. I’m happy that I got to play in all three games (I played the second half against China). Every opponent has a different style and feel, and these differences are more drastic in international games, as opposed to college or Women’s Professional Soccer. Sweden is very European in its play. The players read the game well and look to counterattack. Canada is an athletic team. It plays high pressure and attacks at pace. China is very possession-oriented. Its players have excellent technique and timing and they are well organized. It is an important step for me to feel the differences in playing against these styles.